On June 20th, the Celtic Whiskey Shop on Dublin's Dawson Street celebrated its tenth year in business. We all have good reason to mark the occasion because that day 10 years ago rescued whiskey from almost complete obscurity in this country. Liquid Irish itself owes its existence to the Celtic Whiskey Shop. I have been a regular drinker of whiskey for at least 20 years but it was the shop that gave me my first taste of a whiskey that could blow me away. That was a Redbreast 15yo in 2005. I decided then to learn as much as I could about whiskey, and the shop facilitated that by hosting tastings with various distilleries. Later, the Irish Whiskey Society was formed by people who discovered a mutual interest at these tastings (once Michael Foggarty - then working at the shop - gave us the nudge we needed). I think it's fair to say that whiskey would have almost no profile in Ireland were it not for the steady efforts of Ally Alpine and his team to tempt and educate us. When I mention whiskey to people they often tell me about a wonderful display window they saw in Dawson Street. The shop runs a very popular series of tastings hosted by Michael Lawlor that I can thoroughly recommend (I include them on this site's events page). Ally himself leads expeditions to his native Scotland to visit some of the many distilleries there. The very first CWS single cask from Midleton was a blend and that's been followed by a yearly release of a single pot still cask. 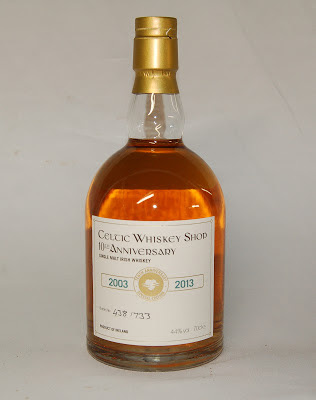 This bottling was vatted from two separate casks, one of single pot still whiskey and the other single grain whiskey. Both components were entirely matured in first-fill Caribbean rum casks. It was distilled in 2001 and bottled only a week ago at cask strength without chill-filtration. 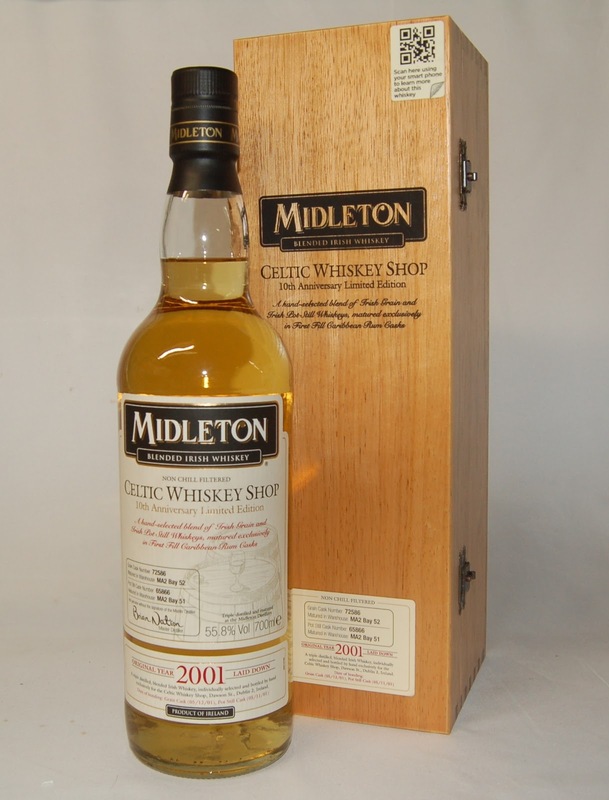 It is the first Midleton to carry Brian Nation's signature as Master Distiller. It is fresh and juicy in character with aromas of lemon, guava, pineapple and a touch of cinnamon. The palate has plenty of body with citrus flavours and notes of pineapples, banana and other tropical fruits, becoming more spicy and gingery towards the finish. A fruity whiskey with some subtle influences coming from the rum casks. Delicious with or without a drop of water. It's limited to 366 bottles which sell for €150.00 apiece. The Inish Turk Beg brand was put into a sort of limbo when its supply of single malt whiskey was cut off last year. The unusually shaped bottle and fruity single malt has been exceptionally popular, according to the Celtic Whiskey Shop, though there remains a limited amount in stock. The Inish Turk Beg story is not over, however, and Ally assures us that we'll hear plenty more from them in the years ahead. A conversation with the Chief Islander of Inish Turk Beg developed into the creation of this anniversary bottling. 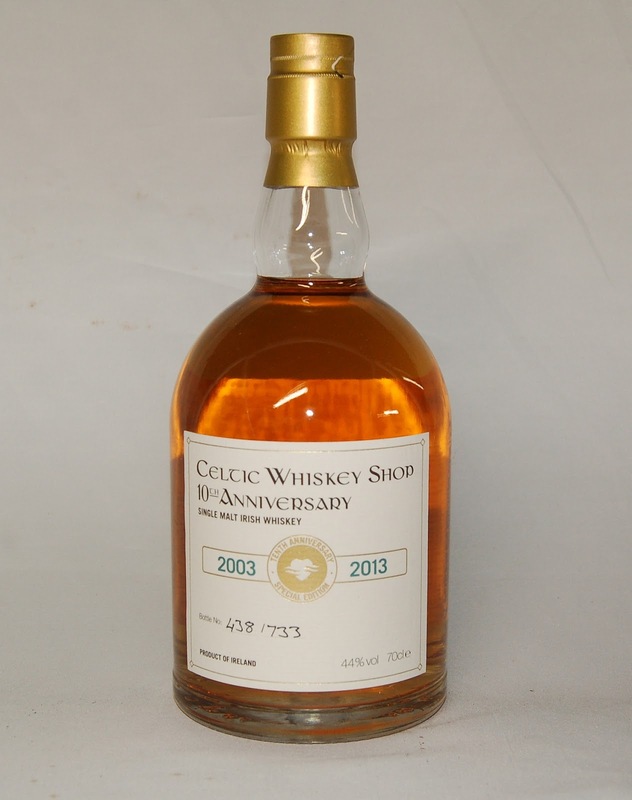 It's a limited edition of just over 700 bottles of Cooley malt, matured for a minimum of 10 years in ex-bourbon casks. These casks also spent a number of months on the shores of Inish Turk Beg breathing in the extraordinary environment. The whiskey was bottled at 44%. It sells for €125. Nose: Delicate and fresh on the nose with aromas of orange sherbet, freshly sliced apples, pink grapefruit and fruit salad sweets. Palate: Fresh and fruity. Medium to full bodied with a nice mouthfeel. Flavours of orange peel, ripe apples, lemon curd, ginger snaps and tropical fruits. Finish: Dry and long lasting with vanilla and a touch of spiced apples coming through at the end. A very good whiskey, fresh and packed full of vibrant fruit flavours.